In Wrist Watch — our monthly column dedicated to timepieces worn in the metal and seen in the wild — resident horology enthusiast Randy Lai spotlights key finds each exhibiting some element of aesthetic, mechanical or cultural significance. This week, after recovering from a bad case of jet lag, we’re switching up our usual focus (i.e. 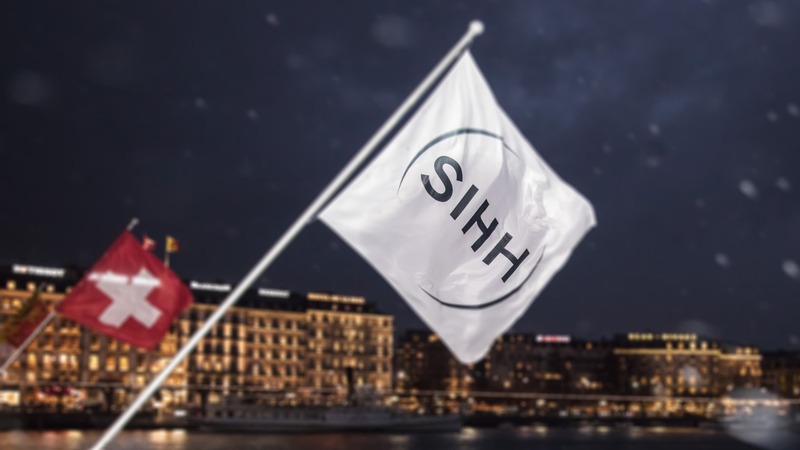 eminent Hong Kong collectors) to bring you a recap of the best new releases from SIHH 2019. You can expect more brand-specific coverage over the coming weeks, but for now sit back and enjoy a selection of watches — ranging from updated classics to exceptional novelties — as curated by our man on the ground. Between the itinerary that traditionally obliges journalists to view 32 brands in four days and an endless tirade of cocktail receptions/celebrity appearances, it’s no wonder that SIHH can often resemble a rarefied horological Comic-Con. Despite that, a few key releases managed to cut through the spectacle; and that’s no small feat — considering the unique atmosphere that hung over our visit to Palexpo. The conversation was of course dominated by Richard Mille and AP — two influential maisons that farewelled SIHH in equally provocative fashion. The former ignited all kinds of meta-commentary about the nature of the Swiss watch industry with a collection of droll confectionary-themed releases; while the latter launched Code 11.59 — 13 contemporary references (equipped with new movements and cases) that have been greeted with equal amounts of acclaim and vitriol. Both presentations are definitely worth unpacking in detail — you can check back next week for our brand-specific stories — but we thought we’d kickstart our spotlight on SIHH 2019 with a look back at a few relatively incognito releases. What do these new watches all have in common? Simply put, they’ve been weighed up, worn and found to be 100 percent awesome! Let’s dive in. 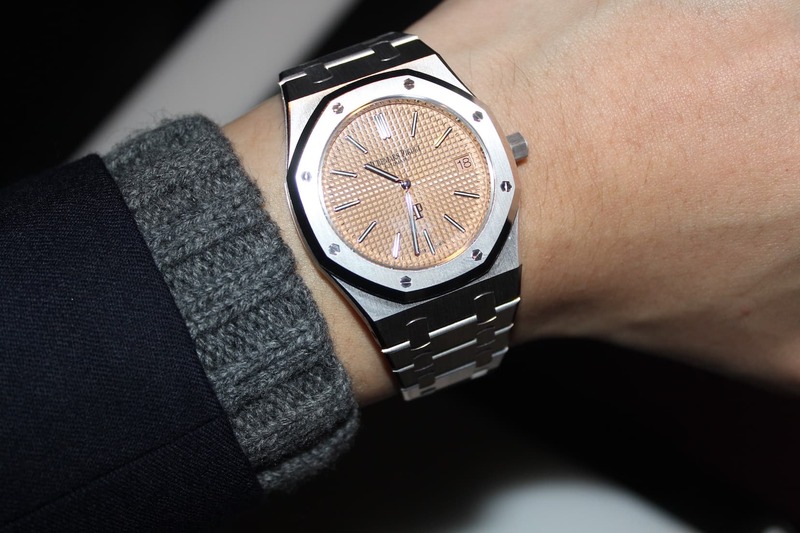 The Audemars Piguet Royal Oak "Jumbo" Extra-thin: in the immortal words of Pusha T, "if you know you know". While Code 11.59 grabbed most of the AP-related headlines this year, the brand quietly rolled out a new version of their celebrated Royal Oak “Jumbo”. Sporting a “pink gold-toned” dial, the 15202BC is the latest in a lineage of “salmon” Royal Oaks that dates back to 1992 (i.e. the 20th anniversary of the eponymous AP design). These have historically appeared in a number of other executions — for instance, the covetable series 25820 Royal Oak QP — but there’s just something extra dashing about this colour when it crops up in a simple time-only release. The pink tint of the petite tapisserie (which almost strays into milky brown) nicely complements the white gold markers and bracelet; and there’s a defined sense of aesthetic and tactile harmony that comes from combining the watch’s white gold bracelet with a salmon dial. There’s no question that the present release embraces the “Jumbo” playbook — crowd pleasing proportions (39mm) and a reliable movement (calibre 2121) — but if you’re the kind of collector who’s looking to add yet another classic Royal Oak to your collection, then chances are that this lack of originality won’t deter you. Priced at HK$435,000. To learn more about the Royal Oak “Jumbo” Extra-thin, visit Audemars Piguet online. The Cartier Santos-Dumont: a product for the people, designed by the jeweller of kings. 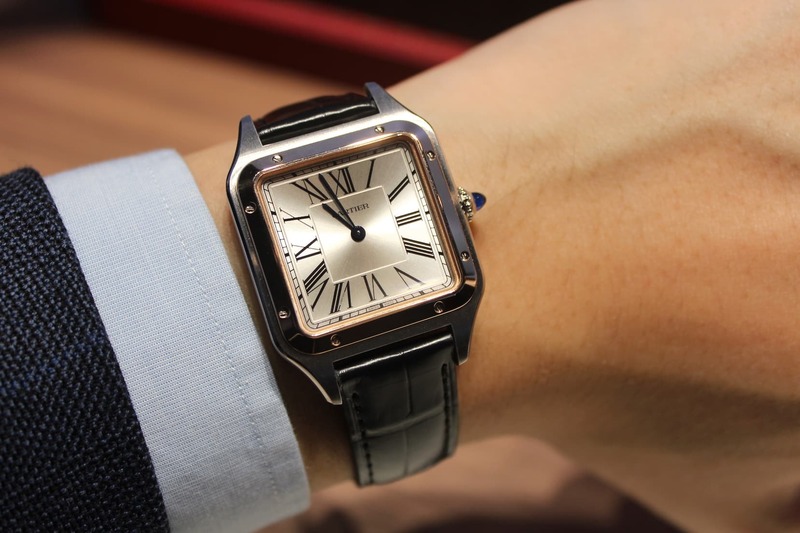 In 2018, Cartier debuted the new Santos collection, complete with patented Quickswitch and Smartlink systems. This January, they’ve expanded their remit in consumer friendly conceptually coherent watchmaking to include the Santos-Dumont range — a trio of entry-level dress watches (in steel or 18k rose gold) which encapsulate “the elegant spirit and dandy style” of namesake aviator Alberto Santos-Dumont. Speaking tangibly, what the maison have come up with is an approachable everyday wearer that doubles as a crash course in traditional Cartier design values. There’s the elliptical Roman numerals, sunburst dial and screw-down case, all of which conspire to shift this into “versatile” dress watch territory; and at 31.4mm, the larger model is bound to appeal to all but the clunkiest of wrists. The clincher is that, in steel, the new Santos-Dumont is available for under HK$30,000. Naturally, the tradeoff is that the power source is long-lasting quartz; and while we’re sure that’s going to infuriate a bunch of haute horlogerie fascists, it’s admirable that Cartier are thinking about general consumers with their newest creation. Priced at HK$29,100. To learn more about the new Santos-Dumont in steel, visit Cartier online. The Hermès Arceau L'Heure de la Lune: an elegant rebuke to the notion that "serious" watchmaking requires a staid dial execution. For their SIHH 2019 presentation, the watchmakers at Hermès were reportedly influenced by the thematic concept of dreams. It’s a good way to describe the new Arceau L’Heure de la Lune: a whimsical double moonphase which dials in the house’s art and design competencies alongside its increasing proficiency in complicated watchmaking. Unlike a conventional moonphase — which displays the sunlit portion of the celestial entity via a recessed aperture — Hermès’s newest novelty makes use of two discs (i.e. the northern and southern hemispheres) revolving around a coordinated set of static moons. That endears the latter to decoration: the “southern hemisphere” features a Pegasus motif by Dimitri Rybaltchenko; while the “northern hemisphere” resembles the lunar surface (thanks to the use of an intricate image transfer). On the aventurine dial, the effect is extremely novel: eliciting the sense that you’re staring down at two moons suspended in the midnight sky. It may look simple — as Hermès assuredly intended — but to realise this highly original take on the moonphase, a whole new proprietary module had to be developed and fitted to the movement (calibre H1837). Now that’s not something you’d do unless you were a “serious” watchmaker. Priced at HK$219,900. 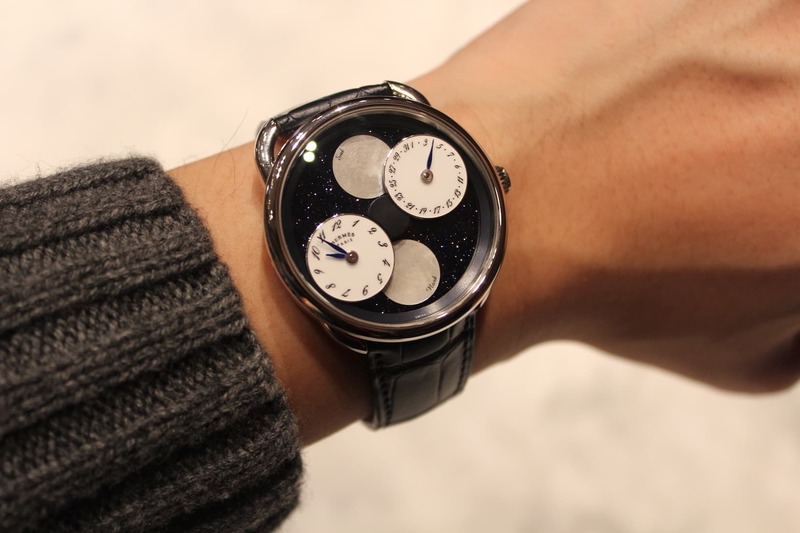 To learn more about the new Arceau L’Heure de la Lune, visit Hermès online. The A. Lange & Söhne Zeitwerk Date: a 512-component "smart watch" that marries the functionality of digital tech with the precision of German watchmaking. For SIHH 2019, Lange celebrated a quarter century of its eponymous Lange 1: the killer app (if you’ll pardon the expression) that helped resurrect the brand in 1994. And while that timepiece is undoubtedly significant, we found ourselves inexorably drawn to the most un-Lange of Lange novelties — the new Zeitwerk Date. 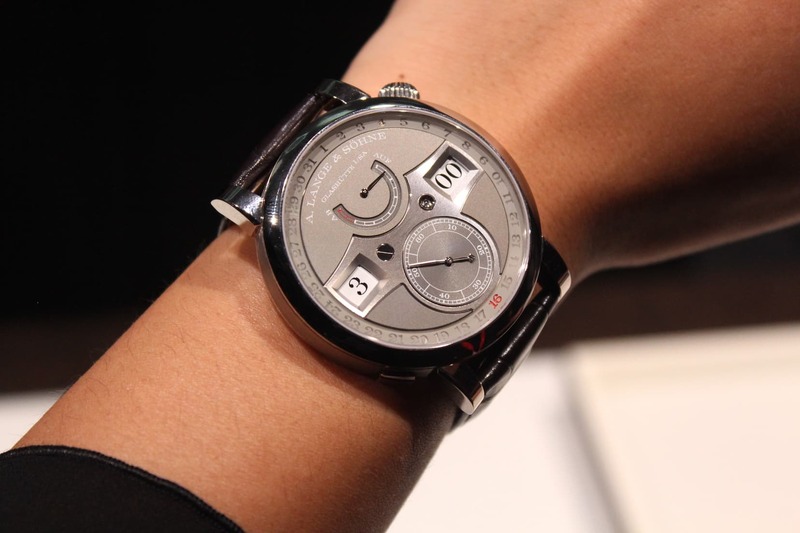 Jokingly referred to as “a smartwatch, the Lange & Söhne way” the Zeitwerk was first introduced in 2009. Previous iterations have featured a minute repeater and sonnerie-esque striking time, but all Zeitwerks are typified by the use of a 3-digit display positioned across the dial’s wingspan. As each numeral is powered by its own oversized disc, hours and minutes jump instantaneously — à la the action on a digital clock. This year, Lange have opted to add a more pedestrian complication in the form of the date: a crystal ring, engraved with numerals from 1 to 31, is placed around the circumference of the dial. Beneath this, a bright contrasting counter performs one daily jump at midnight highlighting the current date in red. It’s a classic Lange solution to the traditional date window’s limitations; and the result offers high legibility without comprising the particularities of the Zeitwerk dial architecture. Elsewhere considerable upgrades to the movement have been made, the most striking of which is the constant force escapement. As a remontoir, this mechanism ensures unvarying energy delivery — bringing the power reserve up to 72 hours without expanding the watch’s already leviathan 44m proportions. This kind of non-aesthetic development can be easy to dismiss, but it’s a testament to Lange that they achieve it with zero fanfare and total precision. Throw in a lavishly decorated movement and you have one of our favourite underdogs of SIHH 2019. Priced at HK$795,000 (approx). To learn more about the new Zeitwerk Date, visit A. Lange & Söhne online. The Montblanc 1858 Automatic Chrono: perfect for when you want a dose of vintage and military inspired design to go with your contemporary watchmaking. Capitalising on the mostly warm reception to last year’s 1858 collection, Montblanc have added a trio of watches to their Minerva inspired lineup for SIHH 2019. Consisting of a geosphere, chronograph and time-only automatic, these limited editions embrace one of 2019’s biggest horological trends — bronze. Unlike much of their competition, Montblanc have opted to utilise a bronze alloy that is not pre-stabilised and that is made with a high proportion of cupro aluminium. Wearers can expect bronze cases which patina over a 3 to 6-week period, adopting a dark burnished look unique to their particular conditions of use. 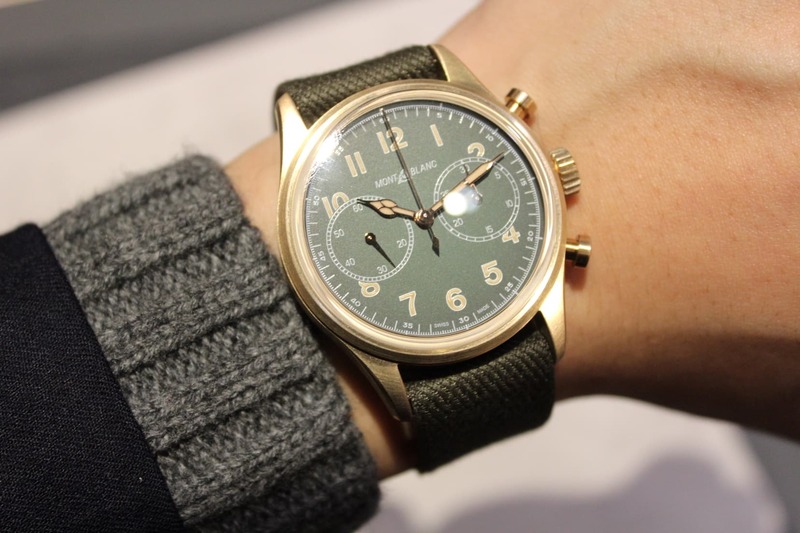 Of all the new bronze case/khaki dial combinations, our favourite was the chronograph. For those partial to the vintage-inspired design language cemented at SIHH 2018 — think Cathedral hands, luminescent numerals and the minuterie-style seconds track — the new chronograph offers more of the same, now in a vogue new 42mm case complete with Minerva movement. Limited to a worldwide production run of 1858 pieces. Priced at HK$40,600. To learn more about the 1858 Automatic Chronograph in bronze, visit Montblanc online.